Free Estimates - Low Cost! 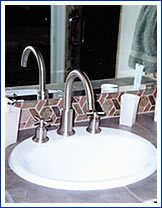 San Jose Plumbing is a family owned business with over twenty years experience in the plumbing field. The owner is Kevin Garza along with his wife Adrienne and son Adam. Kevin has a C36 HIC licence, and is fully insured and bonded. The company has 15 employees, several of whom have been with the company since its beginning. San Jose Plumbing is listed with the Better Business Bureau. San Jose Plumbing provides quality service and satisfaction guaranteed. We have many repeat customers and referrals which is a source of great pride and satisfaction for our company. We are open seven days a week, twenty-four hours a day, including holidays. When a customer calls our company they will speak directly with a dispatcher not an answering machine, however in the event we are on another line they can leave a message on the voice mail and we will return the customers call right away. We specialize in a wide range of services. We repair/replace all types of fixtures, shower valves, and shut off valves of every kind, faucets, disposals, ice maker lines, hose bibbs. We repair and replace toilets. Repair and install water heaters of all sizes for residential homes and commercial business. We also replace water lines/sewer lines/install gas lines/complete repiping of residential homes, mobile homes, condos and townhomes. Remodels of bathrooms, kitchens and replace tile. We specialize in drain cleaning - main lines - kitchen laundry lines and hydro jetting for commercial and residential properties. We install property line clean outs, clean outs, and small under counter grease traps. San Jose Plumbing provides service through out the Santa Clara Valley to many restaurants, commercial businesses, property management companies, real estate brokers, schools, shopping centers, and churches. Our company donates time and money to various individuals and organizations. We also donate time and materials to those clients who are financially unable to have their plumbing needs taken care of.